My name is Glenna and I’m here to tell you that you too can be a stubborn pouty knitter and do the bare minimum progress needed to eventually finish a knitting thing…and still eventually finish the knitted thing. And then end up using almost your entire apartment floor to lay out pieces of same for blocking. Good timing, too, since it’s coming up on a long weekend and I’m about to vacate the premises and leave these babies laid out to dry. 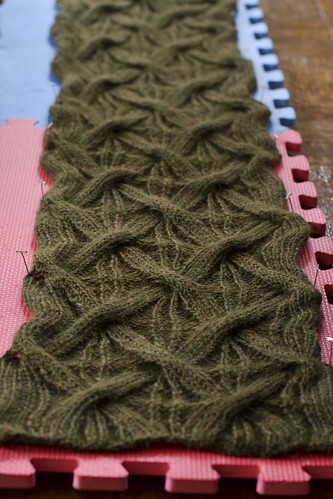 Now, here’s where I confess a shortcut – the Pi Shawl has been laid out but not pinned. 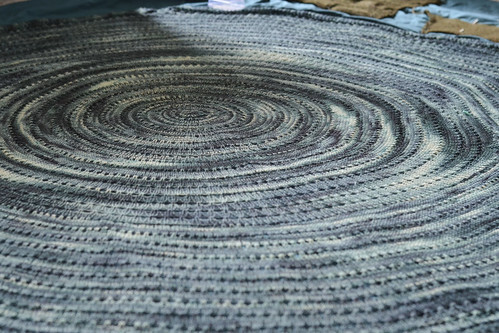 I let myself off the hook on that one partly because I don’t have enough pins to block both the Pi Shawl and the sweater pieces at the same time (Reverse Me is 7 pieces total, before seaming), but also because it’s essentially a drapey circle, so as long as I can sort of smush it out into a circle as it dries, that’s fine by me. There is also the, uh, small matter of sewing together these aforementioned 7 pieces together into a sweater. Thankfully, that’s a problem for Future Glenna. Possibly for Next Week Glenna. I’m also glad for Past Glenna who set herself up with an around-and-around stockinette top-down sweater back in April, because that’s pretty soothing to pick up and work on as I breathe a sigh of relief of finishing up these 2 projects that saw me through much of the winter. Onwards with spring knitting. And also a reminder (to myself, if to no one else), to practice being kind to yourself – the knitting doesn’t mind taking a little longer to get finished. Whether you’ve got a long weekend or a regular one, I hope you have a good weekend ahead! Happy knitting as always. Congratulations on two projects blocking! I just laid out the bulky sweater I finished today on the blocking boards. It does feel good to have a new fall item ready to go. Now on to some lighter sweater items. What’s next for you? Very cool shot of the pi. At first glance, it looked like a rug. I might try that. Thank you Glenna for giving me ideas! 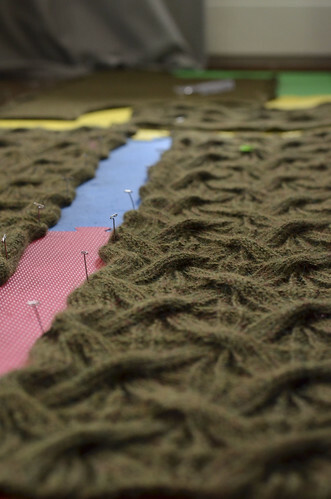 Good for you–that’s a lot of yardage off the needles! Re Linda A, felting a rug: sew it into a pillowcase and use a commercial laundromat that has a heavy-duty machine. They both look amazing!! I love the way the colors swirl on the pi shawl. Those all look amazing. You did a fantastic job! Major Kudos to the Past, Present, and Future Glenna!! I absolutely love how the colors variegated in your shawl. Beautiful projects and beautiful finishes. 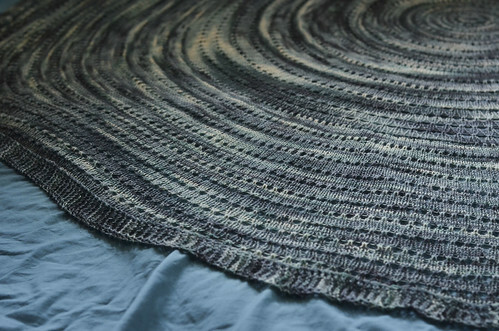 The cables are spectacular and the pi shawl…dreamy.